'ITS NOT OVER TILL ITS OVER.'" together on the pages of a young Ted Wales sketch books. Ted Wale was 100 years old in August 2010. And he is still drawing and painting. His studio, an iron shed in his back garden, is a miscellany of little treasures compelling the visitor to look and delve. The works are small and keenly drawn with a strong emphasis on the tonal values that give shape and form to an object. His inspiration has been to capture the light and shade, whether it be in a landscape, a portrait or figure compositions. He paints directly from the subject, or from sketches, done on the spot and later worked up in the studio Ted is always faithful to his topic. From the beginning, Ted has been a member of our group and is now a Life Member. He was there at the very first meeting held at Cabramatta High School in answer to the advertisement which had been placed in the local paper by Evelyn Healy c. 1961, calling for expressions of interest from local artists for the forming of an Art Society. He has held all the Committee of Management positions, been there at all the various meeting sites which included members homes/studios, Cabramatta Civic Centre, Arthur West Hall and Westacott Cottage, and participated in art exhibitions held in banks, Buckleys Hardware store in Cabramatta, Fairfield Council building, Fairfield Community Centre, and the Fairfield Arts Centre. Teds love and passion for art led him, for a short time after 1945, to become a student member of the Society of Realist Art in which Noel Counihan and Rod Shaw had associations. From about 1945 to 1950 he bcame a member of Joe Holloways sketch club which was situated just behind the Capitol Theatre in Sydney. 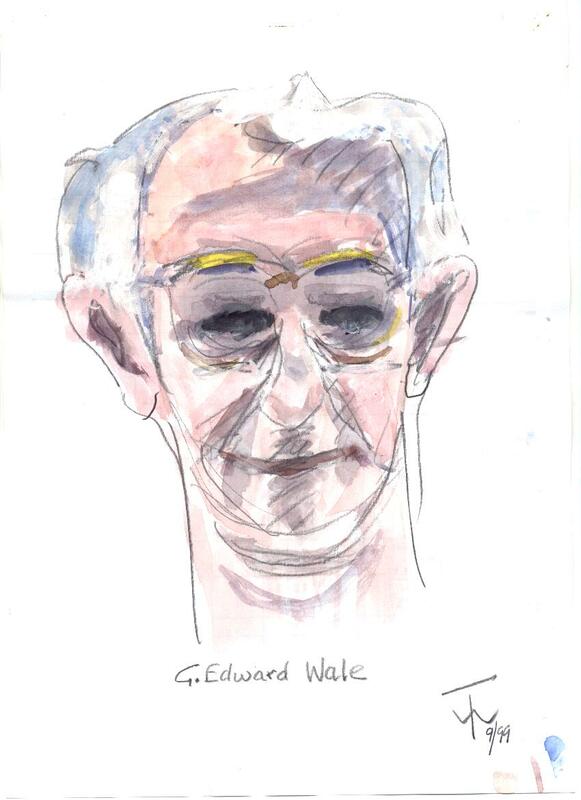 In more recent times, up until about 1995, Ted has been a Royal Art Society Sketch Club member. Not interested in exhibiting as a solo artist, Ted has found satisfaction in achieving his own mental and emotional uplift as a practising artist, though he says with a smile, he has burnt more works than he has kept. Fairfield City Concil has acquired a few of Teds landscapes and a few have sold to interested buyers. For years, frequent trips to the Art Gallery of NSW, especially the Australian Traditional section, were a source of inspiration, Max Meldrum being a special favourite. Nowadays, Ted is sketching the people, children and animals who pass by his doorstep. To celebrate Ted's 95th birthday, the association organized a retrospective show titled "Much In Little" at the Fairfield City Museum & Gallery. A similar exhibition was held at the newly established Artists Corner at Club Marconi to celebrate Ted's 100th birthday, where Ted was made an Honorary Life Member of the Club.